An exposed root Natal Banyan (Ficus natalensis) named "Benevolent Dragon" represents the Chinese emperor protecting his subjects; trained utilizing Chinese philosophy concepts. The Chinese calligraphy is "pun-sai." 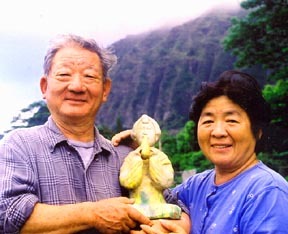 The same characters became the Japanese "bon-sai. China has the world's oldest civilization and the oldest proof of a form of artistic pot plants. But the paintings on the tomb walls are nothing like the bonsai of today. 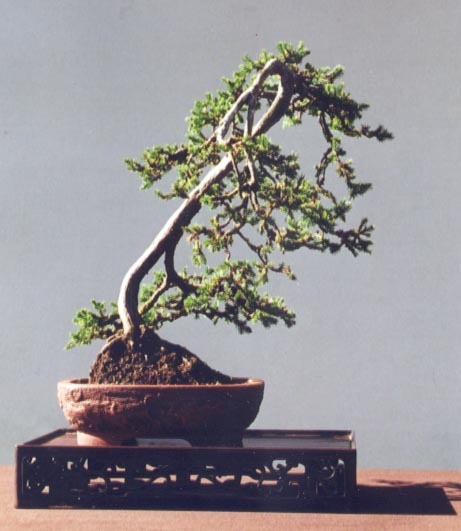 Aristocratic Chinese penjing are also nothing like the commercial bonsai currently being produced in Chinese communes for export. Aristocratic Chinese penjing are the products of a society that no longer exists. Its leaders had an extra brilliance and others naturally followed. Most Chinese never had formal schooling opportunities and learned farming or a trade by doing. Of those that went to school, only the brightest and most promising advanced to become literate. Of these, only the most successful and wealthy had the time and interest to be part of an elite aristocratic society. PENJING RULE #1: "SMILE!" Penjing is an art and a hobby to be enjoyed. When you smile, your mind opens up, you create, and you enjoy! PENJING RULE #2: "DON'T LET ANYONE MAKE UP ANY MORE RULES!" CHINESE PENJING CAN BE ALMOST ANYTHING DEPENDING UPON WHO YOU ARE TALKING TO! There are endless forms as many versions of "Artistic Pot Plants" were developed spontaneously in different regions of China. If one person's styling was admired, often all of the hobbyists in that city or district copied and it became the popular style. So there are a huge number of styles developed in isolation. Fuku-Bonsai has borrowed principles from various styles and has created its own "Tropical Penjing" based upon an interpretation of Chinese principles, art concepts, and the unique horiticultural traits of our plants. The articles below attempt to explain some of our foundation. 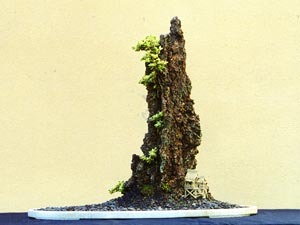 Penjing is totally different in concept from Japanese bonsai! It's based upon a totally different styling concept. "Benevolent Dragon" gives insights. 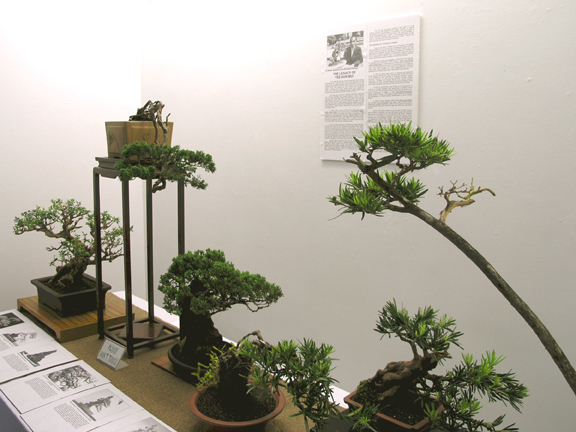 Several forms of penjing are stylistic craft. Here are just four of the aristocratic Chinese art principles that make it exciting and unpredictable! There are masculine and feminine forms of penjing. Stout powerful forms contrasting with elegant rhythms. 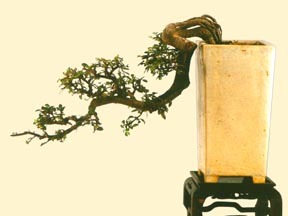 Styling bonsai is the greatest challenge and there are many forms of inspiration. 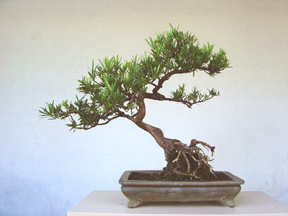 Japanese bonsai tend to replicate codified styles. 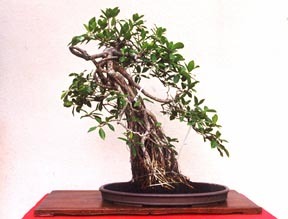 "Nature's Bonsai" enhances and builds upon old knarled collected specimens that already have character. The podocarpus trees in our collection are trained to illustrate Chinese styling influences. Four photos of old Chinese homes give an insight into the differences between the Japanese and Chinese cultures and the differances between bonsai and penjing! YEE-SUN WU; The Spirit of Man Lung Penjing! More than any other individual, Hong Kong's Yee-Sun Wu introduced Chinese penjing to a world centered on Japanese bonsai. He added new applications to older techniques and these were the basis from which Fuku-Bonsai's training methods developed. A member of Fuku-Bonsai's International Honor Roll. 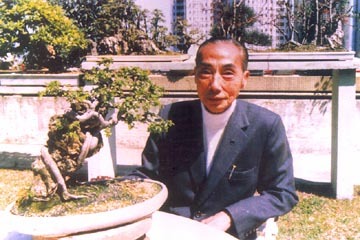 Yee-sun Wu passed away on May 11, 2005 at the age of 100. 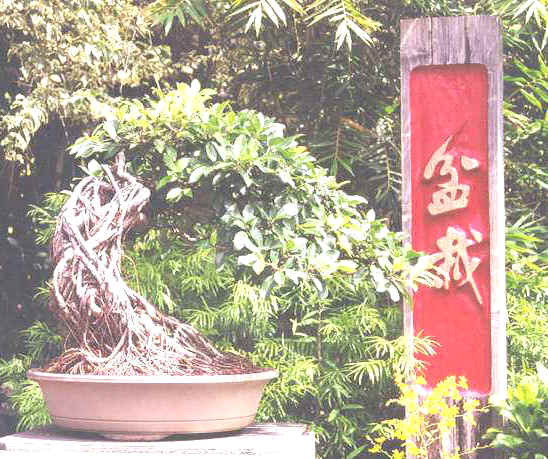 This tribute recaps and recognizes the unprecedented contribution that he single-handedly made to share the aristocratic penjing art with the world! The July 2006 show honored Yee-sun Wu. 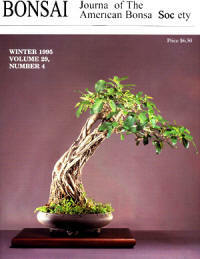 The article was submitted and published by Bonsai Clubs International in their Oct-Dec 2006 magazine. 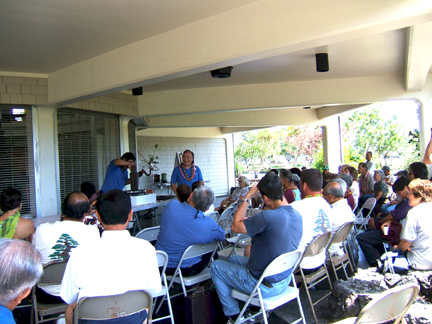 TROPICAL PENJING LECTURE-DEMONSTATION HONORS YEE-SUN WU At BIBA'S 25th Anniversary show, the lecture-demonstration featured a Jaboticaba trained utilizing the philosophy of Yee-sun Wu. 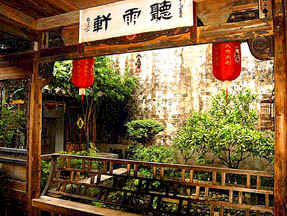 Styling based upon a theme is a major penjing concept. What makes this tree unique? 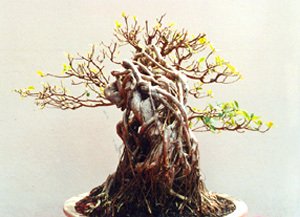 How can that uniqueness be repeated, emphasized, and utilized to create a truly unique bonsai? The Chinese produce the full range of "landscapes" from a miniature desktop "Rock & Water" arrangement (with no plants), to tray penjing, to courtyard atriums, to urban estate gardens, to full-size Imperial Gardens. Their close-up rock plantings, middle view tray landscapes, and vast panoramic arrangements explore the full range. Here's a small vertical and horizontal sample. WALTER & ANN LIEW'S DRAGON GARDEN! Hawaii is fortunate to have this outstanding scholar-artist! 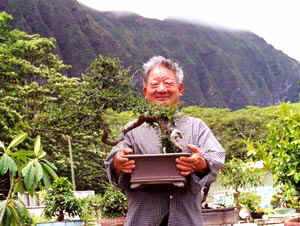 If you'll be visiting Honolulu, call ahead and plan to spend a day with Walter at the Hawaii Bonsai Culture Center. 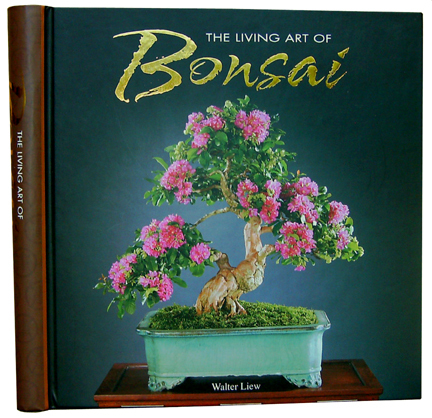 You'll leave with a whole new bonsai perspective and a better understanding of Chinese history and philosophy! It's always a pleasure to visit Walter and Ann and it's wonderful that they are making great progress!